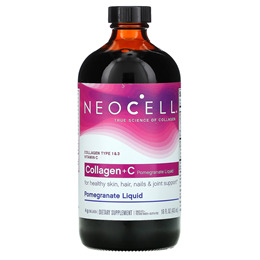 Collagen + C Pomegranate Liquid is a scientifically formulated blend of NeoCell’s award winning, clinically studied collagen peptides, vitamin C, and supporting nutrients. Using NeoCell’s technologically advanced hydrolysation process, large collagen molecules are enzymatically hydrolysed into small peptides that are both bioavailable and bioactive. Vitamin C, with collagen, contributes to normal collagen formation for the function of skin and bones. Inside of you is your own personal fountain of youth. A brilliance that is waiting just beneath the surface. It’s your body’s own collagen, and all you have to do is awaken it. NeoCell, the most trusted brand of collagen since 1998, know what it takes to illuminate your beauty from the inside out. And they have the science to back it up. Purified water, Bovine collagen, organic cane sugar, pomegranate (Punica granatum) juice concentrate, cranberry (Vaccinium oxycoccos) juice concentrate, citric acid, elderberry (Sambucus nigra) juice concentrate, Vitamin C (Calcium ascorbate), green tea leaf extract, natural flavours, preservative: potassium sorbate, sweetener: steviol glycosides, trace minerals, anticaking agent: silicon dioxide (nano). Take 15ml alone or mixed into 200ml of water or juice. For maximum absorption, take on an empty stomach. Food supplements must be used within the framework of a healthy lifestyle and not used as substitutes of a varied and balanced diet. As with any supplement, if you are pregnant, nursing or have a medical condition, consult your doctor before using this product. 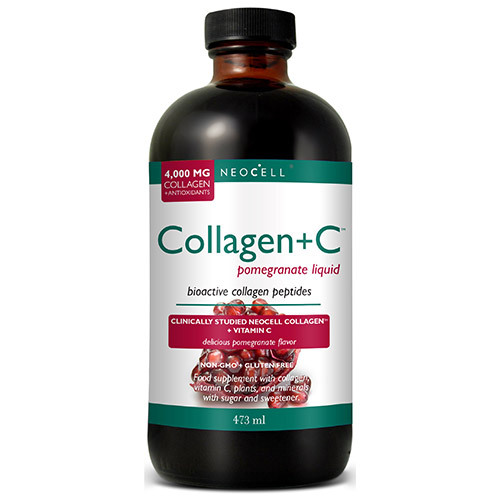 Below are reviews of NeoCell Collagen + C - Pomegranate Liquid - 473ml by bodykind customers. If you have tried this product we'd love to hear what you think so please leave a review.